Westminster Tool Partners with Moosup Elementary School to Increase Industry Awareness - Westminster Tool Inc. 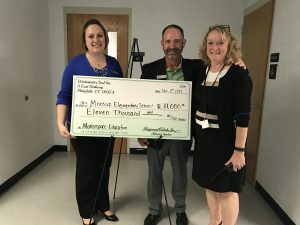 Here at Westminster Tool, we recently embarked on the next step of our industry awareness journey by partnering with Moosup Elementary School to help fund a Makerspace Program. A Makerspace is a collaborative workspace for making, learning, exploring and sharing. It uses hand on learning and critical thinking to help prepare those who need the critical 21st century skills in the fields of science, technology, engineering and math (STEM). Beyond this, the program helps to build confidence by providing students with a creative outlet to succeed. established by the American Mold Builders Association (AMBA) to support programs in the communities of their members that champion training, advocacy, and research and development. As a member of the AMBA, we successfully applied for $10,000 to help fund the Makerspace Program. Our vision is that the Makerspace Program will introduce students to hands on learning and collaboration early in their academic career. The champion behind the Makerspace Program at Moosup Elementary is the school’s Principal, Colleen Lugauskas. She approached Westminster Tool at a community event and shared with us her passion for starting a makerspace program for elementary students. Early on in the conversation, it became clear that this type of program would be a great opportunity for us to reach a younger demographic by introducing them to problem solving and critical thinking. As an organization that recognizes people as our greatest asset, workforce development and industry awareness investments are crucial for our success. All of our previous outreach efforts focused on reaching high school students. Unfortunately, we have realized that we are coming “late to the game” in our efforts. In Connecticut, students decide in eighth grade whether they want to attend a technical or comprehensive high school. In order to help students make more informed decisions about what type of high school they would attend, we decided to include a younger demographic; elementary school. Thanks to our partnership with Moosup Elementary, we now have an outlet to do so. What’s important to note with the Makerspace Program, is that we do not expect all students to pursue a career in manufacturing as a result of their experience. The Makerspace Program encourages students to pursue a whole new area of creativity, problem solving, hands on learning, and collaboration. Such skills are not only vital to the manufacturing industry, but will empower students to succeed regardless of what career pathway they may choose. However, if a student does want to pursue a career in manufacturing, the pathway for hands on learning does not have to end after they leave Moosup Elementary. These students can go on to the local high schools, Plainfield High School or H.H. Ellis Technical High School (Ellis Tech). Each high school provides a different career path into manufacturing. Ellis Tech prepares students to enter the workforce, while Plainfield High School feeds students into the Advanced Manufacturing Certificate Program at Quinebaug Valley Community College. We rely on such programs and pathways to help us recruit and hire the best and brightest to join our team. Investing in the future of our business means investing in the future of our community. We have and will continue to invest in partnerships such as that with Moosup Elementary to support awareness of the manufacturing industry, and to ensure that students are provided with the necessary training to explore and succeed in their careers.